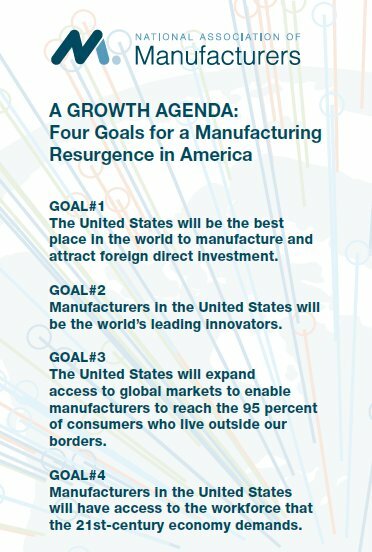 The four-point Growth Agenda from the National Association of Manufacturers is a score card for policy makers at the U.S., state, and local level for ensuring the chances for a manufacturing resurgence are realized. The agenda is familiar in many ways, not just because I've been writing about the need for a national manufacturing policy for years but also because Licking County is living it. 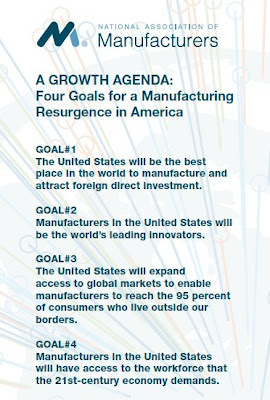 Goal One is really a statement of the need to embrace manufacturing, which would be the 10th largest economy in the World if it were its own country. Investing in infrastructure and ensuring energy independence are key too. We are doing our part in Licking County, including creating Grow Licking County with the motto "Simplifying Success" which is aimed right at making more people see that Licking County is the best place to manufacture and invest. Goal Two is a policy challenge for innovation to find ways to spark R&D and protect intellectual property rights. Licking County boasts R&D from companies like Bayer MaterialScience and its prototype design center to UTC Aerospace Systems and its next generation inertial navigation systems R&D. Goal Three is a focus on access to markets, not just a plea for more free trade agreements but also a plea to enforce fair trade too. Licking County manufacturers stand out for export capability, but we can always look for more ways to advocate to improve. Goal Four is workforce and a call to invest in skills training and focus on STEM skills. This really could have been goal one. Though it starts with improving our national approach to funding education vs. skills training, it really is a local issue to provide a skilled workforce. Licking County's C-TEC is one of the few providers in Ohio of a NAM MSCC-certification for entry level workers. While many have talked about STEM education efforts, Licking County has done it. Workforce truly is number one on our growth agenda. Today, I'm pleased to play host for the Licking County Chamber of Commerce Manufacturer's Council. This is the leaders of Licking County manufacturers coming together to learn from each other and grow their business.